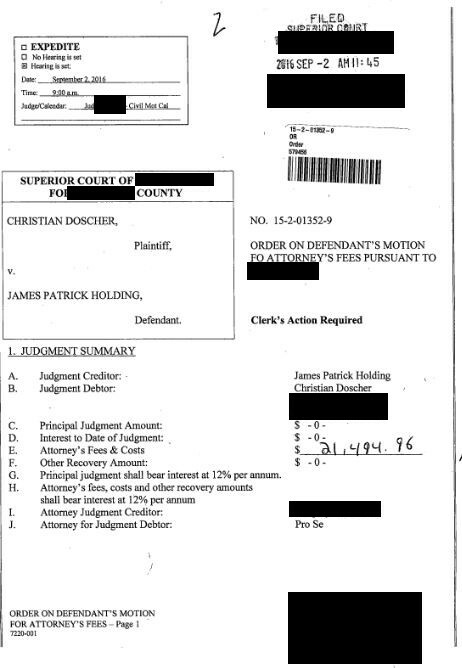 As of 9/2/2018, Christian Behrend Doscher, aka Barry Jones, aka turchisrong, owes me $26,963.27. When is he going to pay his bills? There’s a particularly moronic notion that some people might come up with in response to what is below. They might ask if the Context Group (whose work I cite below) agrees with what I’m saying here, and think that actually is a meaningful question. It’s not. The Context Group certainly agrees that riposte was the norm in Biblical times, which is the single and sole point that I derive from them. What they may not agree with me on is whether it is appropriate today. I don't disagree with their interpretations. I disagree with their applications. I don't draw conclusions about those applications from their research. I do that on my own. And if they think what I argue is a perversion of their work, then it's likely they've been grossly misinformed by a tendentious source that is giving them leading information to draw out a desired opinion, and also not likely being thoroughly forthright about their own agenda, history and purpose. But that said, so what if they don't like my applications? I would say in reply: That’s their problem, not mine. Last I checked, Rohrbaugh, for example, thinks the book of Nahum is too nasty and should be removed from the canon. That’s obviously a position I don’t agree with, and it's not a matter of intellectual deficiency for Rohrbaugh to hold that view since the key facts (such as that Nahum has harsh language) are not in dispute. Rohrbaugh's view on Nahum is a moral decision he makes based on his own preferences and his own "take" on Christianity. I do think those preferences (and his "take") are absurd, narrow-minded and out of touch. I would even go so far as to say that such views about the canon are a perversion, and that Rohrbaugh is guilty of perverting the truth to that extent. His views in that regard were not the product of his scholarship but of his own experience. But the bottom line is: I agree with their findings, and I don't think they misinterpret the New Testament. However, I also don’t agree with all of their applications of those findings. There’s a huge difference, and very simple minds may not grasp that difference. They also fail to grasp that it is quite possible for someone like Rohrbaugh to be judiciously informed on one matter while being profoundly ignorant on other matters. (This in contrast to fundy atheists, who are profoundly ignorant about just about everything.) And of course, there is no reason to bring up Rohrbaugh's ignorance on any point until the issue actually comes up. However, if any of the Context Group ever wished to argue that such language is inappropriate today, my reply is that they need to mind their own business and look past the rarified confines of academia. Scholars like Malina and Rohrbaugh don’t spend any time confronting atheist idiots like DarkMatter2525 or NonStampcollector. They’ve never engaged in forum debate with lunatic fundy atheists who keep quoting Thomas Paine as an authority on the formation of the canon, or who have some sort of personality disorder and keep posting mile-long blog entries no one ever reads, or who have never done anything with their lives except work as day laborers or truck drivers and sit around collecting government checks and don’t have a job while they otherwise rack up huge six-figure debts they can’t pay off. They also, not shockingly, never appeal to the Bible as authoritative justification for their views about modern behavior (because as the Nahum example shows, the Bible isn't their chief defining authority). They don't think Nahum is a good example for us. So of course the Bible isn't their final word as a moral guide. It's also relevant that they aren't out there like the fundy atheists peddling their views deceptively and in gross ignorance. If any Context Group member doesn’t think there’s a place for hard language today, good for them – they need to get out more. I'm out in the trenches; they are not. They are far from being my favorite Bible scholars, nor have I ever worshiped the ground they walk on; nor do I quote them the most on this website. I respect their expertise and use it, but I can use the research of the Context Group even if they disapprove of my views and the way I apply that research. For the record, no Context Group member has ever written to me about any of this. And if they ever did, I'd invite them to spend a few hours on YouTube and get some eye-openers. But I don't expect they'd waste their time anyway. Rohrbaugh is in his 90s, and it is absurd to think that he or any of the other distinguished academics that are part of the Context Group spend any time trolling YouTube channels. Anyone who claims that has a severe burden of proof to fulfill. With all that said, what place does satire and the like have - what place can it have-within the defense of a religion based on a God who is love? A brief examination of Scripture and the Fathers of the Church will shed some light on when such talk is appropriate, and why it is warranted. Let's begin with Scripture, and some observational notes from the sociological well of Malina and Rohrbaugh's Social Science Commentary on the Synoptics. A favored argument of Skeptics against "un-Christian" behavior of ridicule is to place such behavior against admonitions to "turn the other cheek." Is it proper to do so? An irony here is that some skeptics, such as George Smith, interpret this and similar commands as directives to tolerate injustice and be a doormat, and say "such precepts require the obliteration of one's capacity to distinguish the good from the evil". Depending on what Skeptic you speak to, this is either a command to be very nice to them, or a command to be so nice to them that you become a gullible fool, as they see it. Taken in their social context, such commands require neither action. "Resist not evil," which precedes the "cheek" admonition, is a well-known Jewish proverb (Ps. 37:1, 8; Prov. 24:19) and actually means, do not compete with evildoers by trying to outdo them in terms of getting back at them. Three examples for the teaching follow: Turn the other cheek; if someone sues you for your cloak, also give them your tunic; if you are forced to go one mile, go two. All three of these things refer to what amount to inconvenient, but nevertheless perfectly legal, impositions on the person. The "slap on the cheek" is a type of personal insult, so that the command to turn the other cheek is essentially a command not to start trading insults, but take the higher ground and turn away from the exchange. It is not a license to allow yourself to get beat up. So is it proper to cite this against satire? Only in one instance: If it is a matter of one person speaking to, or interacting with, one person. We shall see that differing rules apply in a situation in which the venue is a public forum, as this site is. Now let us consult Malina and Rohrbaugh to see why. Many ancient societies (and we shall see below, certain modern social groups) engage in a process known as challenge-riposte. The scene of such processes is public venues in which two persons or groups have competing honor claims: "...the game of challenge-riposte is a central phenomenon, and one that must be played out in public." The purpose is for each party to try to undermine the honor, or social status, of the other in an exchange that "answers in equal measures or ups the ante (and thereby challenges in return)." In the Gospels, Jesus "evidences considerable skill at riposte and thereby reveals himself to be an honorable and authoritative prophet." Many of these challenges are clear, but some are so hidden to us that they need exposition. Most Skeptics are too busy worrying about Abiathar and Ahimelech in this passage in the Markan parallel, but read closely it is a tremendous insult to Jesus' Pharasaic opponents. "Have you not read...?" Of course they had. The Pharisees were experts in the Scriptures. They read them every day. They were the Ph. Ds in Bible in their time. To ask them, "Have you not read...?" is to essentially call them stupid, unable to read what was in front of them, not having done proper study. This is proper in the public forum and a response to the honor challenge laid down by the Pharisees, who challenge Jesus on the behavior of his disciples. Jesus ups the ante by questioning their very knowledge of the Scriptures, a trait they most cherished. The art of insult was highly valued in antiquity. Our modern "victim culture" encourages persons to find the art offensive, but before getting too judgmental, consider that in these honor challenges, the person who ended the game by throwing a punch was considered the big loser. Losing one's temper and throwing a punch was as much an admission that one could not keep up the battle of wits and had to resort to violence. When Jesus runs from those who pick up stones to stone him, he is not the coward, but the winner taking his spoils. There are ample instances of such riposte in the Old and New Testaments (1 Kings 18 and Matt. 23 are excellent examples) and to the extent that we engage Skeptics on a public forum, such actions are neither "un-Christian" nor any reason to suppose that discredit is put upon Christianity by such actions. Of course, Ignatius didn't have to deal with anything like the modern atheist, but from the above, we can gain some understanding regarding his feelings towards the corruption of Christian faith. Ignatius reacted this way towards heretics and apostates. From his writings, one gains the impression that he would have regarded such a one as a ghoul or a monster, an absolute abhoration. The image of John the Apostle riding through Asia Minor on a steed seeking out heretics to wage war against comes to mind-or perhaps, better still, his leaving of a public bath 'lest it fall in' due to the presence of the docetist heretic Cerinthius. And this fact-the stance taken towards heretics and those who pollute the Faith-is intriguing in the extreme. Is it not John who wrote the most apologetic Gospel? Is his theology not steeped in Wisdom literature, particularly, the Wisdom of Solomon-the Old Testament's natural theology work par excellence? Would it not be more in order for John to simply have reasoned with them, pointing out the beauty of the Truth as he had done so successfully in his Gospel? Is it not certain that such actions are dissonant with he whose Spirit guided insights led him to confess things such as 'God is Love'? At first glance, it doesn't seem to fit, but the fact that this attitude is definitely Apostolic in origin cannot be denied, and that it was rooted in the nature of the society (from which we of our own will have vastly differed) also cannot be questioned. Like the New Testament authors, Ignatius and Polycarp wrote epistles. As the Church continued to grow and develop, circumstances required a more thorough refutation of emerging heresies. The first major work along these lines is Irenaeus's 'Against Heresies'-a five volume work devoted primarily to refuting various Gnostic teachings, contrasting them with the teaching of the universal, or 'Catholic', Church. Like the earlier Fathers, it is a combination of the love for the Faith, and therefore disgust with heresy, that ignites the manner of his response. Yet unlike those who preceded him, Tertullian's skill as a wit and an author rises to the surface as the means itself of refutation, just as much as the actual content of his argument. This places the opponent in an uncomfortable position, for arguments are much more difficult to refute if they are what may be called instances of an incarnation of a vivacious personality - even moreso when the substance of the argument is directly coordinated to the vivacity of the person as a cause. If the apostate won't bring anything to the table, yet still insists on speaking, the table may as well be brought to him, and broken over his head, so to speak. Since it is a fact that there is no amount of intelligence that cannot be disputed by the constant application of stupidity, it seems on the cards that the most ethical, as well as most expedient, manner of dealing with suchlike is simply to put them in a position wherein, since it is obvious that they won't shut up, at least they won't be heard. I don't think it to be the case that Athanasius was trying to be funny, as it seems was the case with Tertullian. Nor do I believe it likely that he 'weighed his words carefully', constructing a masterful rhetorical argument or polemic, as was the case with the Cappadocian Fathers, or even Paul as instanced in Galatians or Romans. This is not to say that I doubt at all Athanasius skill as a theologian - rather, I think it should be pointed out that his style comes straight from the heart, as full of light as the sun and as immediate as a bolt of lightning. There was an element of absolute astonishment at the downright audacity and perversity of the heretics, and one can imagine Athanasius losing his breath, his face contorted into an expression of absolute bewilderment, when confronted with their claims. Modern Skeptics immediately reject such language as distasteful and insulting, but by now it is clear that they are entrenched in subjecivity and beholden to a straw-man Jesus exegeted forcefully from the text with a fundamentalist-atheist hermeneutic. Very few days have elapsed since the holy brethren of Rome sent to me the treatises of a certain Jovinian with the request that I would reply to the follies contained in them, and would crush with evangelical and apostolic vigour the Epicurus of Christianity. I read but could not in the least comprehend them. I began therefore to give them closer attention, and to thoroughly sift not only words and sentences, but almost every single syllable; for I wished first to ascertain his meaning, and then to approve, or refute what he had said. But the style is so barbarous, and the language so vile and such a heap of blunders, that I could neither understand what he was talking about, nor by what arguments he was trying to prove his points. At one moment he is all bombast, at another he grovels: from time to time he lifts himself up, and then like a wounded snake finds his own effort too much for him. Not satisfied with the language of men, he attempts something loftier. "The mountains labour; a poor mouse is born." "That he's gone mad ev'n mad Orestes swears." Moreover he involves everything in such inextricable confusion that the saying of Plautus might be applied to him:-"This is what none but a Sibyl will ever read." Such, then, was the patristic method, adopted by certain of the Church's most wonderfully decorated and venerated Saints, towards dealing with apostasy and heresy, and engaging in polemical dialogue. They never had to deal with the modern atheist, but had fortune granted them such a burden, there can be little doubt in how they would have reacted. At this point, we can return to the initial question, posed at the beginning - what justification can there be for sarcasm and satire in a religion based on the fact that God has revealed himself as Love? The answer is located in the question itself - it is because God is Love that such reactions are warranted. Satire is not a method adopted by all, nor is its application appropriate for every audience; it is tailored to specific instances in which enemy forces gather to deceive the unwary who cannot always defend themselves. The Cappadocian Fathers, every bit as skilled as Athanasius, were far less fiery than he, yet no one would deny that their apologetic efforts failed to yield as much fruit. I have never once seen Richard Swinburne - the greatest modern defender of the philosophical rationality of the Christian Faith - engage in deliberate satire. Justin Martyr's 'Dialogue with Trypho' gives an instance of a more amiable exchange between two parties in disagreement - far more cordial than what we might expect to have come from John or Ignatius, had they been placed in the same situation. Clement of Alexandria, one of the Church's most skilled demonstrators of the 'common ground' shared by Christianity and natural theology (in the hopes of converting the pagan), leaves us with no moments of biting sarcasm. Why can't all Christian apologists act likewise? Not all face the same opponents. Not all have submitted to the modern victim culture. Justin spoke to Trypho person to person. Skeptics who object to satire think in black and white, submitting to the very fundamentalist atheism that makes them unable to read the Scriptures in any way other than they do. But on the other hand, who would deny the value of a 'sanctified wit', such as we find in the likes of G. K. Chesterton? There are a variety of gifts, but the same Spirit, and likewise, there are many forms of apologia, but the same Source and goal. In the final analysis, it seems to me that sarcasm and satire are certainly more likely to help people remain believers, rather than turning them into such. The satirical apologist is usually satirical in proportion to his opponent's unfounded dogmatic certitude conjoined to an unrelenting 'loudness'. The aim of satire is not so much to convert the opponent, but rather, to silence him, and that was indeed the case before the Pharisees, and before the opponents of the Fathers. Its occurrence is consequent upon a love of the Faith, and a desire to rebuke those who arrogantly voice an opinion contrawise. But the very warrant for the use of 'the whip' seems to lie in the Faith which it is meant to safeguard. It is easy to simply say, in a mental exercise utterly abstract and devoid of possible application in the real world, that we ought simply 'be nice'. Yet, if we think of morality in a teleological manner - in this case the 'end' being the preservation of the integrity of the faithful's Faith, and the purity of doctrine - it begins to make sense. There are certain people who has no desire whatever to discuss the truth-claims of the Christian faith. His sole goal, so it seems to me, is quite simply to ridicule Christianity and Christians (which, to me would seem a rather lifeless and dull profession - granting that the Christian is under a delusion, at least we can understand why he is ever ready to fight for his Faith, but whatever awkward manner of vivacity manages to propel the atheist to take such unyielding delight in telling the hopeful that they ought to be hopeless, I fail entirely to understand; were I an atheist myself I should think that, since I am confined to this world, I would be able to find something a little more exciting therein to, at least, fall in love with and fill me with as much peaceable joy and happiness as I am able to obtain in what little time I have). There is no kindness in his approach, and he seems to show none of the 'caution' standard in careful inquiry and exposition. What to do with such a one? If you play the nice guy, you're likely to get swarmed, not by any irrefutable arguments, but rather, by a veritable skyscraper of excess and inflammatory verbiage. And unfortunately, there are those, on both sides of the argument, who are persuaded by such things. We are humans, not computers, and a show of confidence or arrogance does, to some, seem to equate with being the victor. So what does the Christian apologist, in dealing with such as these, do? He fights a spark with a blow torch. Just as, when climbing a mountain, even though the goal is to reach the top as quickly as possible, and therefore, so it would seem, only moving upward in a straight line is the most conducive activity for achieving this end, we often find that it is actually more expedient to, at certain moments, to go to the left or right (for instance, when there is a boulder or stream immediately in front of us); so too, the Christian apologist, out of the love for Love, is at certain times warranted in using sarcasm and satire. As with the Apostles, so too with the Fathers. And today, may he who is able use the gifts of sarcasm and satire. The exact origins of the dozens is uncertain. But "the dozens" resembles traditional African "joking relationships" in many ways, and seems to draw heavily on the African oral tradition. Like preaching, signifying, rapping, and toasting, the dozens reinforces the high value placed on verbal skills in the African diaspora. Also called "playing the dozens," "joning," "sounding," or "woofing," the dozens is most popular among adolescent boys who usually play the game in front of a neutral audience who egg on the participants. The contestants must develop the ability to remain poised and master the verbal dexterity to respond quickly and creatively to their opponent's insults without becoming angry or violent. The style of the games can be "clean" or "dirty," the insults rhymed or unrhymed. Rhyming insults are more characteristic of contests between children while teenagers and adults stress creativity and improvisation. Social scientists have for years theorized that the dozens is a release for a racially oppressed group, or a way of helping African American males project a masculine identity in a matriarchal culture. In recent years, however, researchers have tended to emphasize the game's role in helping African Americans to resolve conflicts nonviolently and to deal with personal insults impassively, - valuable lessons in a racially hostile society. A very different approach takes a more neutral stance and emphasizes the playful, expressive, and even sporting aspects of flaming. In this view, flaming may be seen as one aspect of a partial return to oral culture in digital writing, which tends to be dynamic and playful, and which encourages interlocutors to pay attention to how messages are packaged. Flaming may therefore have important affinities with a large variety of stylized oral forms of verbal dueling in which performance is central, such as "flyting" in medieval England, or "playing the dozens" among contemporary Black Americans. Public concessions of honor confer status and thereby privileged access to concrete goods. Because, at the small village level, the latter are in short supply, honor likewise becomes a limited good and so the object of competition. Among equals, an affront attempts to rob the affronted person of his honor; satisfaction is required if honor is to be maintained. Honor is defended or lost according to the contestants' performance in the "game" of challenge and riposte, which has three stages. (i) First comes the challenge, or a claim to enter the social space of another, whether by word or deed. The challenge can be positive (as with a word of praise, a gift, a request for or promise of help) or negative (as with an insult, a physical affront, a threat accompanied or not by an attempt to carry it through). (ii) Next comes the perception, in which the individual (and onlookers) evaluate the action in terms of publicly accepted criteria, as to whether the action merely questions, attacks or denies the individual's self-esteem. (iii) Then comes the response, which takes one of three forms: (a) Positive rejection disdains the challenger and his action, in effect humiliates him by denying him the status of equality prerequisite between players in the challenge-riposte game. If the original challenger is in fact an equal, he must avenge this insult to maintain his honor. On the other hand, if the person originally affronted was his superior, no further response is required. (b) Negative refusal is simply no response, where the honor-code requires one; it symbolizes cowardice or sloth in the person affronted and so dishonors him. (c) Acceptance of the challenge involves a corresponding action that constitutes a counter-challenge and potentially extends the game into a further round. The game of challenge-riposte is properly played only among equals. It is dishonorable to "pick on someone" who is not one's "own size." Honor does not require success, but only the attempt. The code makes each man the guardian of his own honor in contests with his equals, where it would be dishonorable to appeal to the courts, which exist to protect the weak against the strong. Self-sufficiency and independence are virtues in such honor maintenance. Then what about 1 Peter 3:14-16? 1 Peter 3:14-16 But and if ye suffer for righteousness' sake, happy are ye: and be not afraid of their terror, neither be troubled; But sanctify the Lord God in your hearts: and be ready always to give an answer to every man that asketh you a reason of the hope that is in you with meekness and fear: Having a good conscience; that, whereas they speak evil of you, as of evildoers, they may be ashamed that falsely accuse your good conversation in Christ. The use of satire or riposte, it has been said, is not "meekness and fear" (or "gentleness and respect" as modern versions say). This passage is often used to admonish against being too "rough" on opponents, but it is used thereby out of context. In the ancient world, there was no such thing as "something for nothing". You did a favor to get a favor. So when Christians helped their neighbors, others were inevitably suspicious. "What is it they want in return?" When they professed to want nothing in return for helping the sick, etc., it raised suspicions more: "They must be out for something BIG!" As Carlin Barton observes in Roman Honor (225), in a play by Plautus, the poor man is "not only embarrased but deeply suspicious of the kindly and equal treatment afforded him by his rich neighbor" out of "fear of being patronized" and because it "threatens to make him even more hopelessly in debt to, and so more vulnerable to, an already more powerful man." 13 Now who is going to harm you if you are enthusiastic for what is good? (helping a sick pagan neighbor, for example) 14 But even if you should suffer because of righteousness (even if they persecute you or slander you because they misinterpret your motives), blessed are you. Do not be afraid or terrified with fear of them, 15 but sanctify Christ as Lord in your hearts. Always be ready to give an explanation to anyone who asks you for a reason for your hope, (be ready to explain that Christ has given you your reward, which is why you don’t ask for one from the person you help, as you would be allowed to do) 16 but do it with gentleness and reverence, keeping your conscience clear, so that, when you are maligned, those who defame your good conduct in Christ may themselves be put to shame. (This is an attack on their person and what they do, not on truth.) 17 For it is better to suffer for doing good (helping that neighbor who is sick, etc), if that be the will of God, than for doing evil. So while this verse is often used to relate to apologetics...it actually doesn't, and it also does not forbid the use of satire or riposte in settings where the truth is at stake. Then what about Col. 4:6? And pray for us, too, that God may open a door for our message, so that we may proclaim the mystery of Christ, for which I am in chains. Pray that I may proclaim it clearly, as I should. Be wise in the way you act toward outsiders; make the most of every opportunity. Second, if applied absolutely, then Jesus, Paul, and others violated this direction repeatedly, and the Old Testament is full of "bad seasoning". What about 2 Timothy 2:24-26? It should be noted to begin that "men" is a KJV insertion for clarity, and it does in a sense mislead. The "all" here contextually is the flock to whom Timothy teaches, and refers to a single person who is leading no one astray but themselves. This has no relevance to confronting ideological opponents who are leading others away from the truth. Heb. 12:25 See that ye refuse not him that speaketh. For if they escaped not who refused him that spake on earth, much more shall not we escape, if we turn away from him that speaketh from heaven. This is in line with the much broader dichotomy between public and private discourse and encounter in the social world of the Bible. A rather naive response to this distinction between public and private address is that the distinction isn't explicitly found in the text. This sort of response is illicit on multiple counts. First, it enables criticisms by other groups that certian things are also nout found in the text explicitly (eg, JWs re the Trinity; atheists re Jesus in certain OT prophecies). Second, it ignores the fact that as a high context setting, the distinction is something that would be taken for granted and did not need to be made explicit in the text. Third, it is manifest that this distinction is clearly being practiced and observed in the NT (eg, private-private in Timothy, public-public in Matthew 23). if it is not, there is no way to explain such things as Jesus engaging the Pharisees with insults that does not make Jesus out to be a hypocritical bully. The denier of this distinction is forced to enter into absurd gyrations and special pleading ("it just HAPPENS to look like that, but it isn't") for the sake of a desired conclusion. "Jesus only attacked fellow Jews. He reserved his attacks for 'insider' criticism." The argument assumes that if Jesus had encountered an atheist or a pagan who attacked the truth or his ministry, he would have been nice to them, unlike his reaction to the Pharisees. This is merely a contrived defense. Jesus' interaction with non-Jews was minimal and none of those he encountered presented themselves as opposing the truth or opposing Jesus. There is no data pool to speak of to decide that Jesus would not have attacked a pagan critic of the truth as he attacked the Pharisees. Besides that, the Pharisees WERE "outsiders" in terms of their social ingroup -- they were not Jesus' disciples. This objection also defines "insider" too broadly. "But we should be all things to all men and modify our approach for today's culture." Then it's time to give up blood atonement too. No, modern culture has forbidden riposte as a way to prevent deserved criticism and to silence the critic. To that extent, the culture itself is sick and those who reject valid riposte are themselves aiding and abetting the sickness. "Attacking people this way is prideful." For some, it may be. For others, pride has nothing to do with it. "Matthew 5:22 disallows addressing others, especially believers, as fools or with other such names." Matthew 5:22 is irrelevant to this matter for a number of reasons. First, it is clearly about relations with one's brother (not physical brothers, of course, but fellow believers) and about words said in anger to that brother. Thus it would not forbid addressing eg, atheists as fools. Even then, however, it would be foolish (irony intended) to apply this to calling anyone -- even fellow Christian or putative Christian -- a "fool" or a moron or stupid today. The contextual connection here is to Ps. 14:1, which says, that the fool says that there is no God. Thus the idea would be that we are not to call other Christians deniers of God. Within the full-orbed context of this passage -- Judaism -- this has no bearing on our modern word "fool" (or related words) which are used to indicate that a person is showing a lack of intellectual acumen, or is acting foolishly in some other way (eg, throwing away money gambling). To conclude this results in patent absurdities: Why would it be wrong to assess another Christian's intelligence with this specific word -- yet quite all right for Jesus to address Peter as "Satan"? Without the context of Ps. 14:1, Jesus' command amounts to a senseless legalist absurdity that allows Christians, by example, to address each other with the name of the being who epitomizes evil and rebellion against God, but denies that they are able to question the intelligence and acumen of that same believer. On the other hand, it makes perfect sense that we would not be allowed to judge another believer by calling them what is in essence "non-believer" -- which in essence amounts to denying that God has the power to save those who make professions of faith. Beyond this, it is fair to note that this warning is about persons who are angry. It may not occur to those with less maturity that satire and riposte may be delivered calmly, rationally, and for targeted strategic purposes (eg, shaming those who err and mislead). Of course, those whose agenda forbids the use of external contexts to define this passage will use the excuse that none of this is specifically stated in the text. However, such persons have no real reason in this to reject the argument and are merely objecting because they are offended by the possibility that such words as "moron" truly apply to them precisely because they lack intelligence; and what we say elsewhere here of "it's not in the text" applies as readily here. Within Jewish polemical circles, there were certain conventional insults delivered to rivals: Charges of deceit, blindness, blasphemy, dwelling in darkness. These charges did not necessarily serve to finally and definitively exclude the subject from the group in question. Thus, for example, even within the Qumran community, accepted members could be reckoned as being mouthpieces for Belial; likewise Jesus could one moment give Peter a good report and the next moment refer to him as Satan! Paul shows distinct signs of using polemical hyperbole of a recognized sort (notably irony) in this letter. In 2 Cor. 11:20 he refers to his opponents as "making slaves" of the Corinthians, and uses imagery associated with slavery, like being slapped in the face. Now obviously the opponents did not literally come and make slaves of the Corinthians; this is a case of polemical hyperbole. Likewise, in Paul's lists of woes upon himself (2 Cor. 11:23-8), we see effective rhetorical amplification: Many of the sufferings he lists are duplicated within the list. Thus, we may argue, Paul's opponents may indeed be true Christians who, because they have disagreed with him on what he considers to be a fundamental point, he describes with the utmost polemical hyperbole as false apostles. And if Jesus can call Peter Satan, why can Paul not refer to members of the Jerusalem apostolate (if he indeed goes that far!) as false apostles? Sumney's work takes this matter a step further and performs a rhetorical examination of ALL of Paul's attributed letters, determining based on rhetorical function what can be definitively said about Paul's opponents. Sumney's case is directed to a specific misuse of Paul's letters -- performed since Baur's time, and still use by critics today -- in which Paul's word are "mirror-read" so that it is assumed that everything he says is a specific response to an opponent. Given rhetorical usages in Paul's time, it is apparent that such mirror-readers are actually over-readers making modernist assumptions about the text. Not all such rhetoric was meant to be taken literally, nor would readers have understood it as such. In the Hellenistic era polemical remarks were often tendentious and partisan and included exaggerations and unsupportable charges about one's opponents. Early Christian anti-heretical writers commonly made exaggerated claims about their opponents and often accused them of deceit or immorality. (JPH note: As did the Romans, who accused the Christians of cannibalism, among other things.) Irenaeus' treatment of the Gnostics is a prime example. He disparages them every way he can and is willing to caricature and misrepresent them. Since Irenaeus was not alone in his willingness to use any means available to discredit and defeat his opponents, it seems probable that polemical contexts contain exaggerated claims about and partisan evaluations of opponents. Therefore, we must consider statements within polemical contexts to be somewhat unreliable and the more directly the opponents are mentioned, the less reliable the statements are likely to be. Sumney goes on to note that statements made in other contexts -- notably didactic ones, where instruction is given to readers -- is far more likely to be reliable for the modern critical historian, since they are instructions to the readers on what to do. 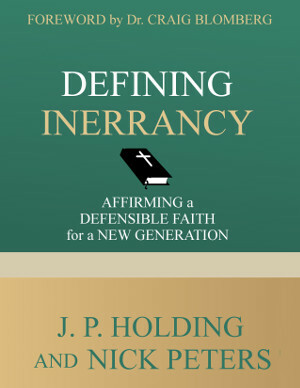 He then evaluates each Pauline letter in turn, and identifies various passages in terms of their likelihood to be reporting what ranges from stock polemic (not to be taken literally, nor meant to be by Paul) to actual and justified criticism. If we may draw a loose parallel, the polemical portions may be taken in the same light as modern professional wrestlers, who beat the daylights out of each other and rant at each other by day, and by night laugh about it over a drink at the local bar. As with the examples of Peter and Qumran above, this is simply reflective of typical "extremist" expression of the period (see more on this here), which is only extremist from our "moderate" perspective and social world. It will be enough for our purposes to provide two examples from Sumney of places where Paul has been falsely read literally because of misunderstanding of his polemical context. The first is Gal. 1:6-7, in which Paul speaks of a "different Gospel". While of course this would tell us that his opponents' message is different, his extreme language may or may not indicate that the opponents are preaching a Gospel that "does not include Christ" (137). This is rather "Paul's ironic characterization of the other teaching" (138) and no more means with certainty that the others are not saved believers than Peter was really being called Satan. Though it is possible (as argued by Nanos, Irony of Galatians) that these persons are not believers in fact, this polemic by itself does not tell us that. Our second example is 1 Tim. 1:3-4, 6-7. Here Paul calls his opponents' views "myths" and this led interpreters in the past to speculate that Paul had in mind some Gnostic heresy. However, Sumney notes (257) that to call an opponent's teachings "myths" is no more than "a stock polemical characterization," so that the idea was "not to accurately describe the opponents' teaching, but to denigrate them and create an unfavorable impression about them before saying anything specific." This is one of several examples of stock accusation Sumney cites; contextually a parallel today might be when someone prefaces comments on what you say by saying, "Bull---!" or "You're out of your mind!" There is of course no actual bovine excrement present, and the opponent in most cases is quite sane, clinically speaking. Thus our reading of Paul and other letters and statements of the NT of polemical nature, need to be read with the nuanced eye of social and rhetorical context. It is a mistake to assume that such accusations were meant to directly address and describe what an opponent was about.